How to Frame a Two-Story House. Building upwards provides the homeowner with more square footage of living space without taking up more lot space. 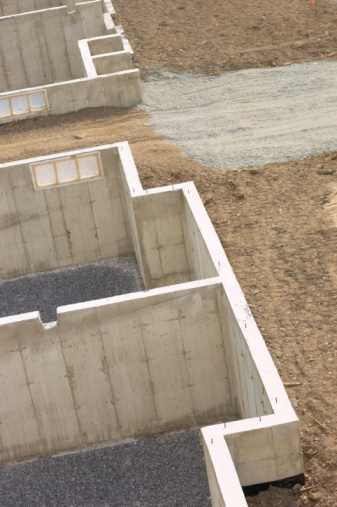 While you will use less material for a two-story house, since there will not be a foundation underneath the second floor, it may still be more expensive to construct since labor charges increase the higher the structure becomes. Attach the sill plate to the foundation by boring holes into the plate. Place a thin layer of foam insulation between the sill plate and the foundation to provide moisture protection. Erect the center-bearing wall in the basement. This is a load-bearing wall that will help support the span of the floor joists. Install the floor joists on top of the sill plate and center-bearing wall, taking care to align the studs with the center-bearing wall for support. Put on the rim joist and install the subfloor directly on top. The subfloor is comprised of 4-foot by 8-foot sheets of ½-inch plywood or a similar product. Purchase tongue and groove sheets and screw them down securely using 2 ½-inch screws. Put subfloor adhesive on the studs before placing the sheets. Put in plenty of screws. Walk around on the subfloor at this point and notice any squeaks. If you find one, add more screws. As a new house settles and shifts, a subfloor can develop squeaks. It's easier to prevent them than it is to correct them later. Layout walls on the subfloor with chalk lines, cut and nail down the wall plates. Assemble your sidewalls, allowing for doors and windows and set on top of the wall plates. Secure with long screws into the subfloor and nail to each other. Repeat the same process to frame the second story as you did for the first, screwing down the subfloor to the top wall plate instead of the sill plate. Install the floor and frame the walls in the same manner. Run a top plate above your second-story walls and attach the roof trusses, unless you are stick framing the roof.